Boo-Hoo Boys - CHARTER SCHOOL WATCHDOG http://www.charterschoolwatchdog. 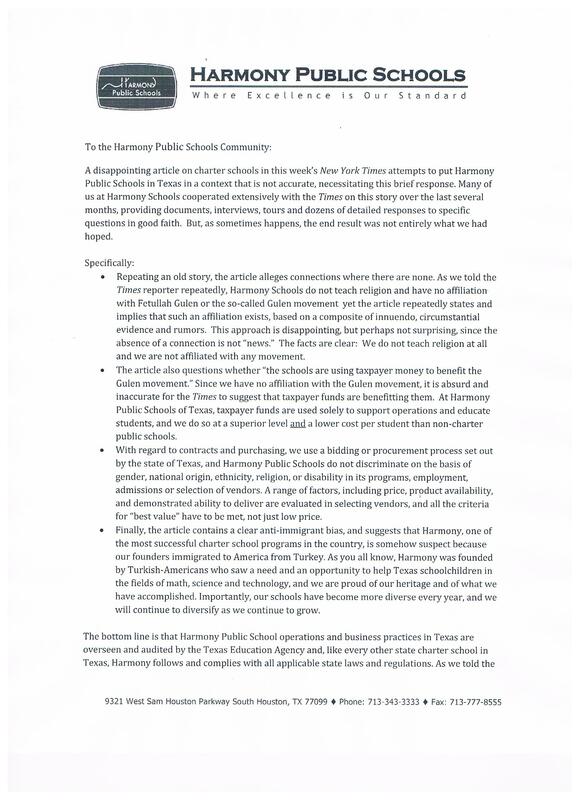 The boys were not too happy with the recent New York Times story about their Gulen-inspired Texas Charter Schools. Seems like Harmony Superintendent, Soner Tarim was a bit miffed over the fact that the schools and their related activities were not as flattering as he would have liked. Tarim did what the guys do best -- wrote a letter to the parents explaining their side and as always, complaining about being unjustly picked on by the Times. What the guys do not fully comprehend is that in the United States we have a little notion about free speech, something that tends to get in the way of the boys' preplanned propaganda plans. Unlike Turkey, we allow our journalists to investigate and publish their findings without fear of landing in the slammer or having their manuscripts siezed. So Tarim was somewhat displeased with NYT Stephanie Saul's story, implying that he was ambushed of sorts. 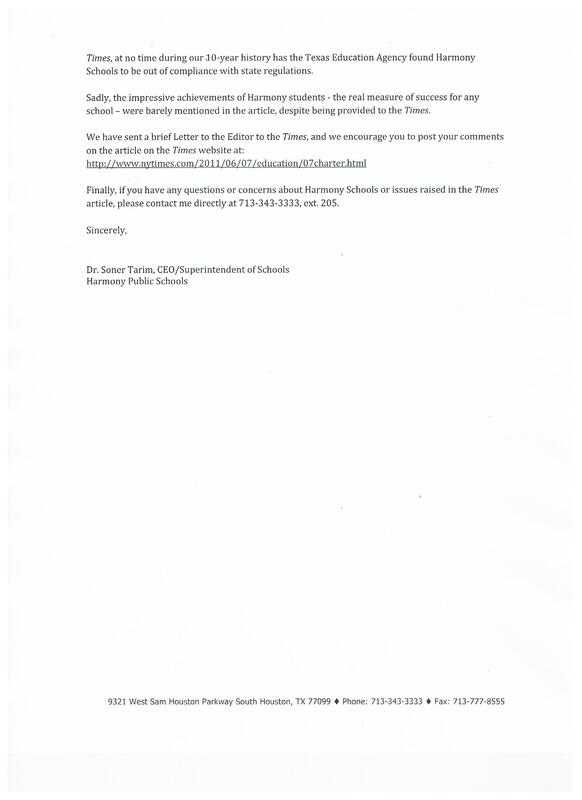 In his letter to the parents, Tarim wrote, " Many of us at Harmony Schools cooperated extensively with the Times on this story over the last several months, providing documents, interviews, tours, and dozens of detailed responses to specific questions in good faith. But, as sometimes happens, the end result was not entirely what we had hoped." Is this guy for real? Did Tarim honestly think that an investigative reporter, a Pulitzer Prize winning journalist, from one of the world's most renown papers was going to buy into his organization's fluff pitch and simply write what Tarim wanted instead of the truth? We suspect the Ms. Saul actually went easy on the boys and left out some really good stuff, some meatier parts of the story, like the Tuzuk money, the vast amounts of taxdollar funds that went to pay for Harmony's H1-B visa green card fees, and the funds diverted from educational funds to pay for their respective educational degrees. According to Saul's story, 19% of Harmony's employees are on H1-B visas. Since an average visa costs about $3700.00 to process (using our tax dollars), it's safe to assume that they spent at least $1,080,400 on visa expenses alone. So when Tarim is whining about how the Times "Article contains clear anti-immigrant bias," we answer -- look in the mirror Tarim. If anything, it's Tarim and his fellow Gulenites who are in fact discriminating against Americans, and have been doing so for 10 years. And when will they finally come clean about their affiliation with Gulen? Enough already -- the cat is out of the bag -- and it's headed towards Washington DC via the "fed" express. Further, and in the words of Tarim, "Repeating an old story," the guys are not here on a mission to "help Texas schoolchildren," they are here to take American teaching jobs while using the American taxpayers to pay for their visa fees, exploit their own immigrant employees, and to continue engaging in all of the shady deals, like some of the ones that Saul exposed in her article. And note to Tarim, if you need to refine your crying skills, seek advice from your leader, he's an expert at sobbing, he's had a lot of practice.